Philip Gaber currently lives and works in North Carolina. He spends the majority of his day attempting to reconcile differences between his conscious and subconscious. In his spare time he tries not to drift around his community as an invisible spirit or juggle more than a handful of moral dilemmas at a time. 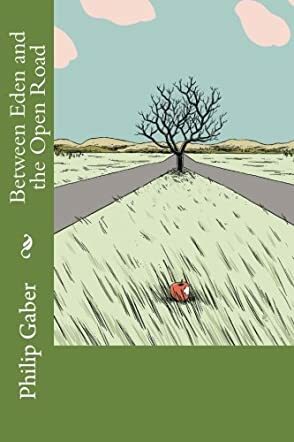 Between Eden and the Open road by Philip Gaber is the most honest collection of prose and poetry you are likely to find out there right now. The collection is imperfect and it asks you to look at what it offers with unafraid eyes, with eyes that ask you to find your way in something, anything. If you are tired, if you are waking up from seeing what life has become, anything like that. This is what Between Eden and the Open road asks of you. I found myself completely enthralled with this book. It is funny, honest, gritty and, even at times, sad. Poetry and prose seem to have fallen by the wayside with publications lately. How refreshing to pick up a book and dive deep into such luscious understanding of the skill. The voice of the narrator can be truly felt as well, guiding you through this wonderland of work and making sure to keep you mostly grounded. Philip Gaber has created a beautiful work with Between Eden and the Open Road. Not everyone will understand this work. Every single reader should try though. This one goes on the very rare 'will read again' shelf for me because I think I will enjoy it even better the second time around. If you are a lover of poetry, or a lover of writing that will force you to open those reading eyes more, and work your brain, you will love this book as I did.